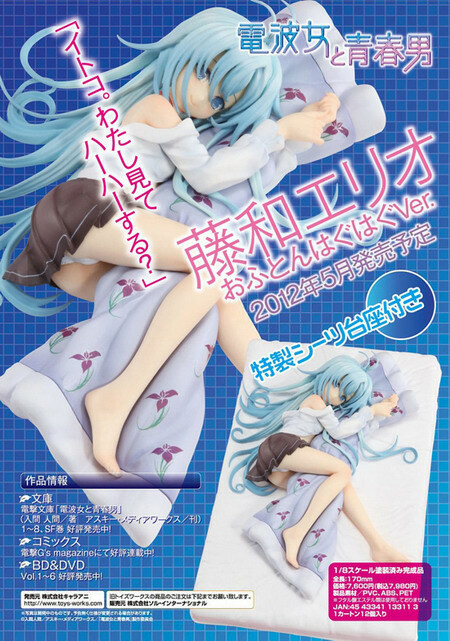 February 13th, 2012 By: GGT Category: 2012/05 release, Figure News. Chara-ani is going to release the Towa Erio ( 藤和エリオ ) Blanket Huggin’ Ver. ( おふとんはぐはぐVer. ) 1/8 PVC figure from the “Denpa Onna to Seishun Otoko” ( 電波女と青春男, Electric Wave Woman and Vernal Man). Will be released in May 2012. Around 170mm long, 6,800 yen.